After picking up our share on Monday, I decided to make a giant salad using a lot of those salad greens since those tend to perish more quickly than some of the sturdier greens we got. 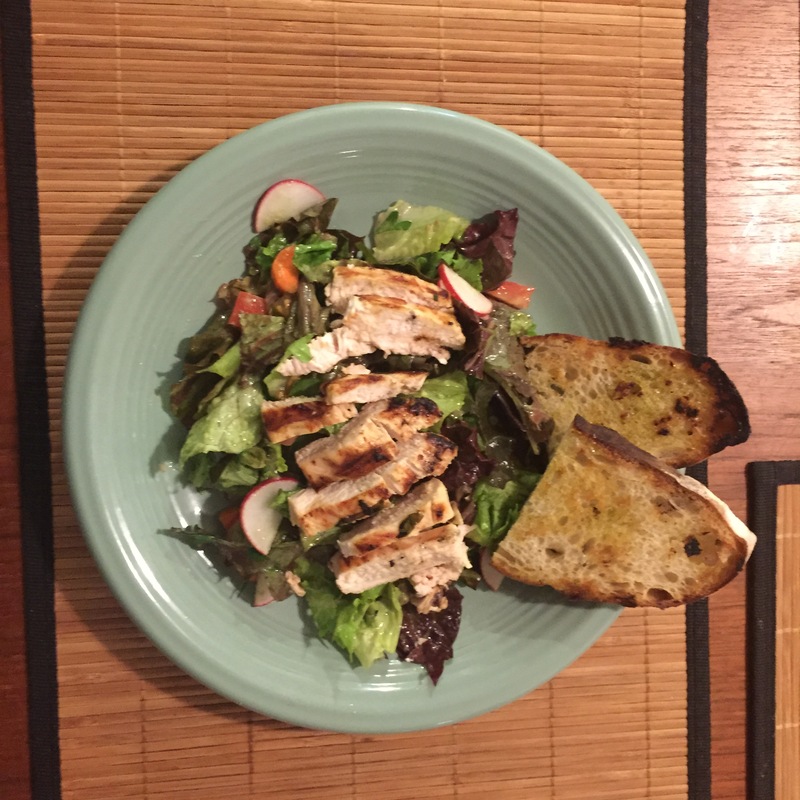 This was basically the greens, radishes from the share, and some grilled chicken (plus some grilled garlic bread). Yummy and simple summer meal! 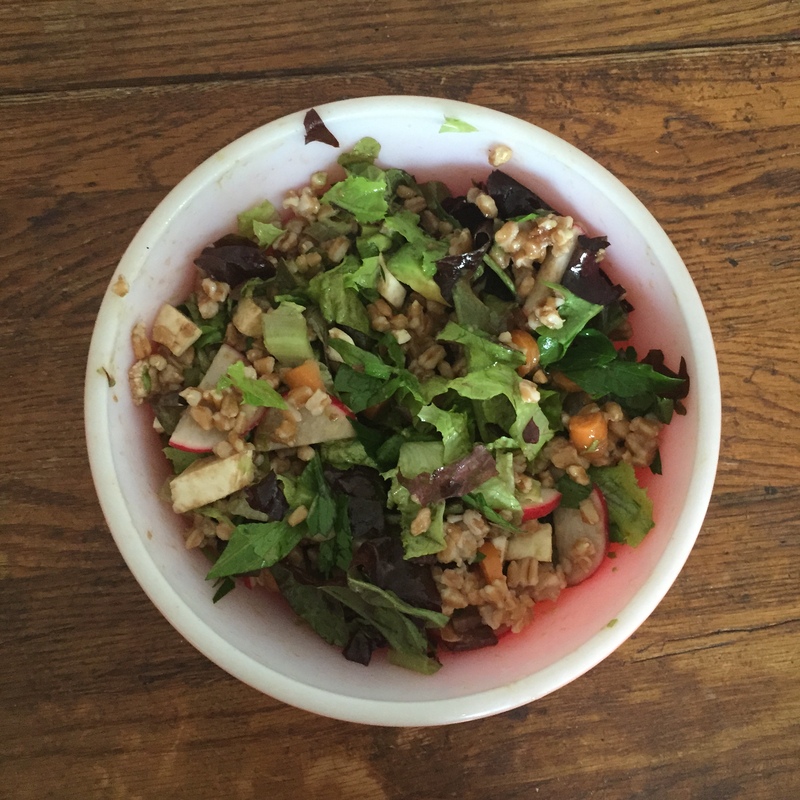 I’ve also been bringing a version of this to lunch a few days this week: salad greens and radish mixed with avocado and faro and whatever other veggies are around. 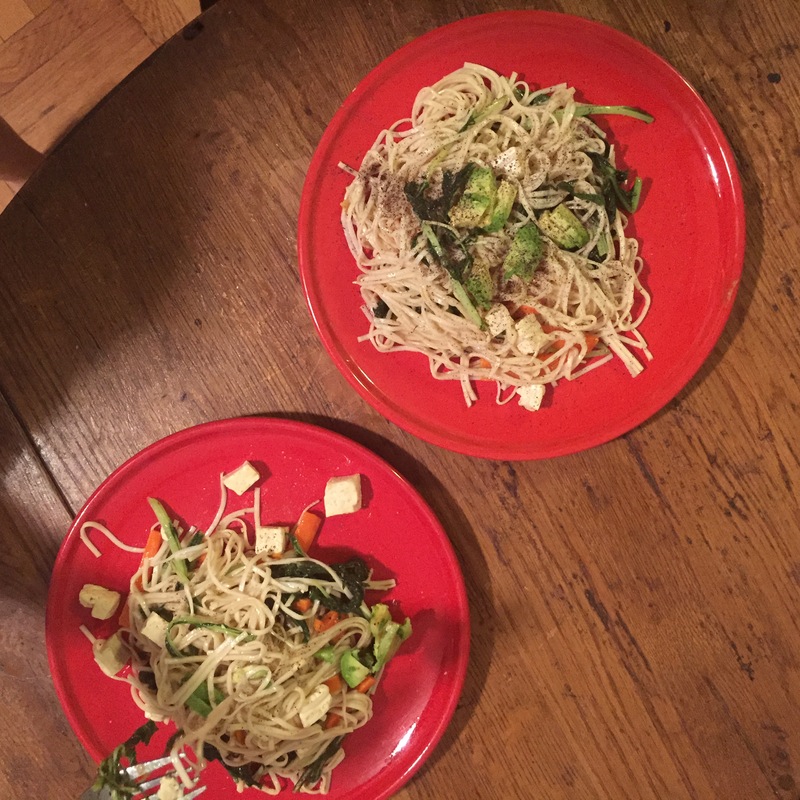 On Tuesday night we made some soba noodles with the mizuna, plus non-CSA carrots and tofu and topped with avocado. This was also great cold the next day for lunch! I work for myself and can have a leisurely breakfast at home most mornings so I’ve been doing a lot of scrambled eggs with greens. 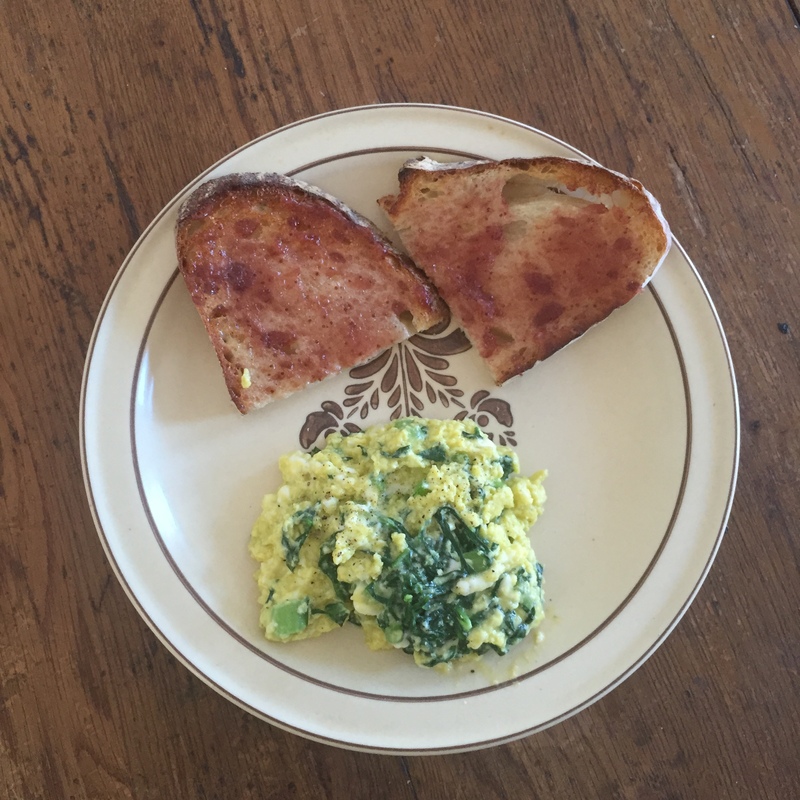 This one is a soft scramble with swiss chard, feta, and garlic. Yum! It became apparent that we wouldn’t be able to use up all that mint before it went bad so I decided to freeze it to use throughout the summer. I just tossed the mint leaves in the food processor with a bit of water to get it going. 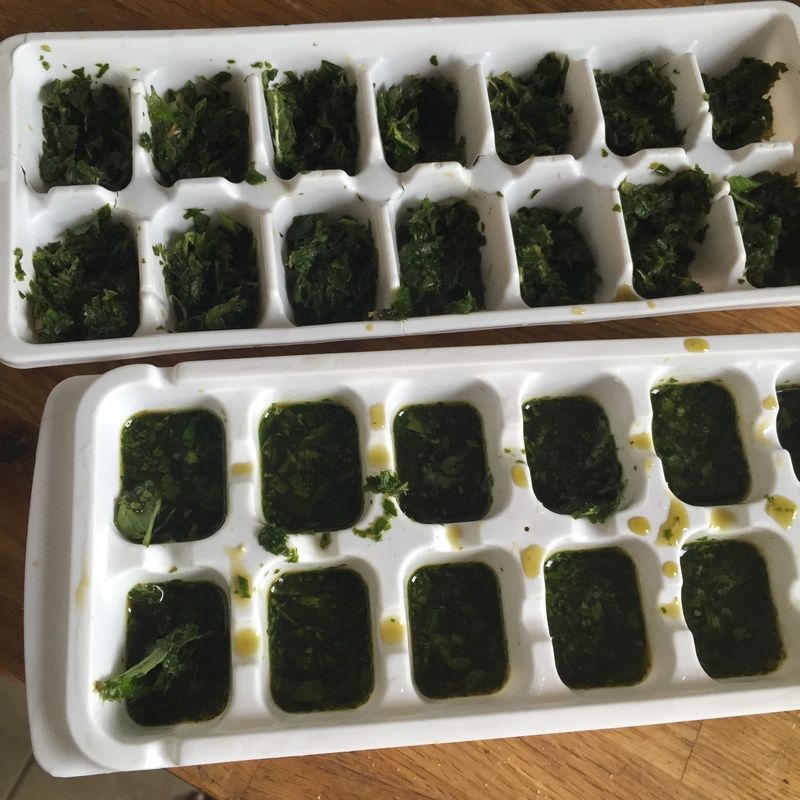 Then portioned it into ice cube trays. Now we’ll use it to toss in drinks or defrost for salads or pestos. 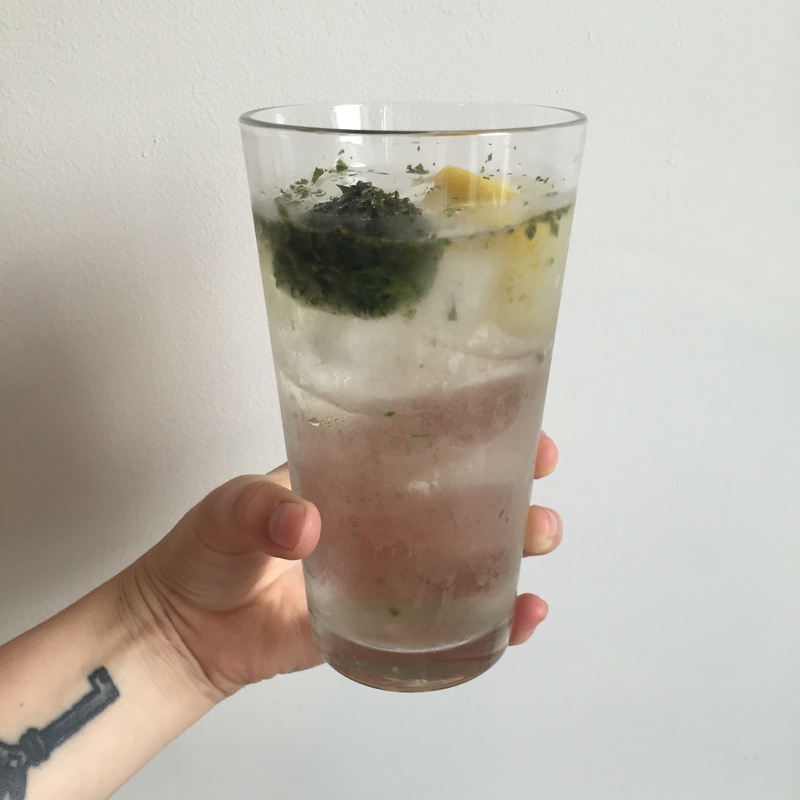 Made a nice gin and soda with lemon and a minty ice cube! 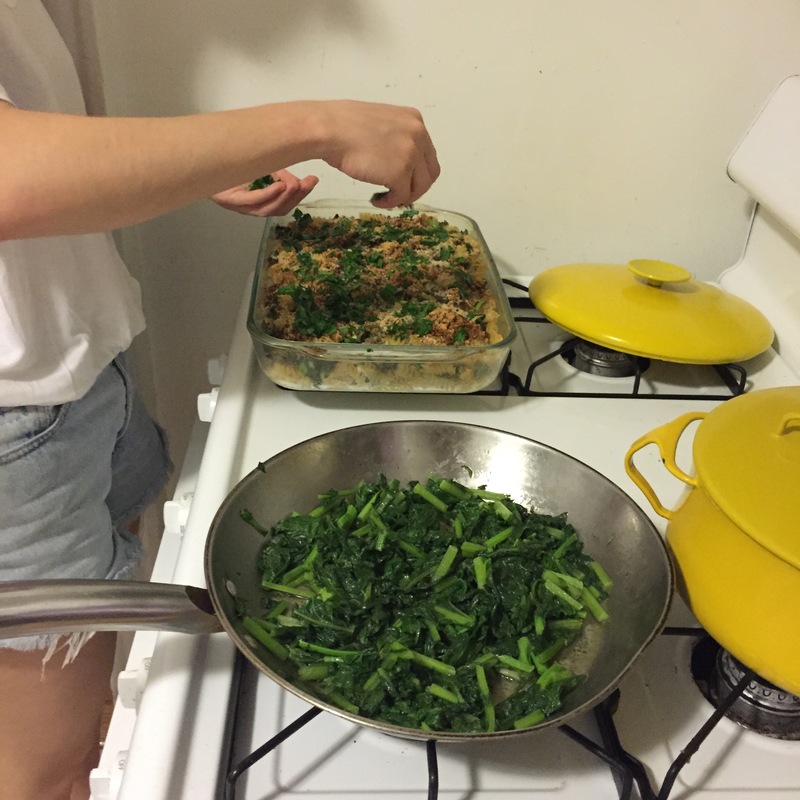 On Thursday night we made this recipe from Smitten Kitchen. 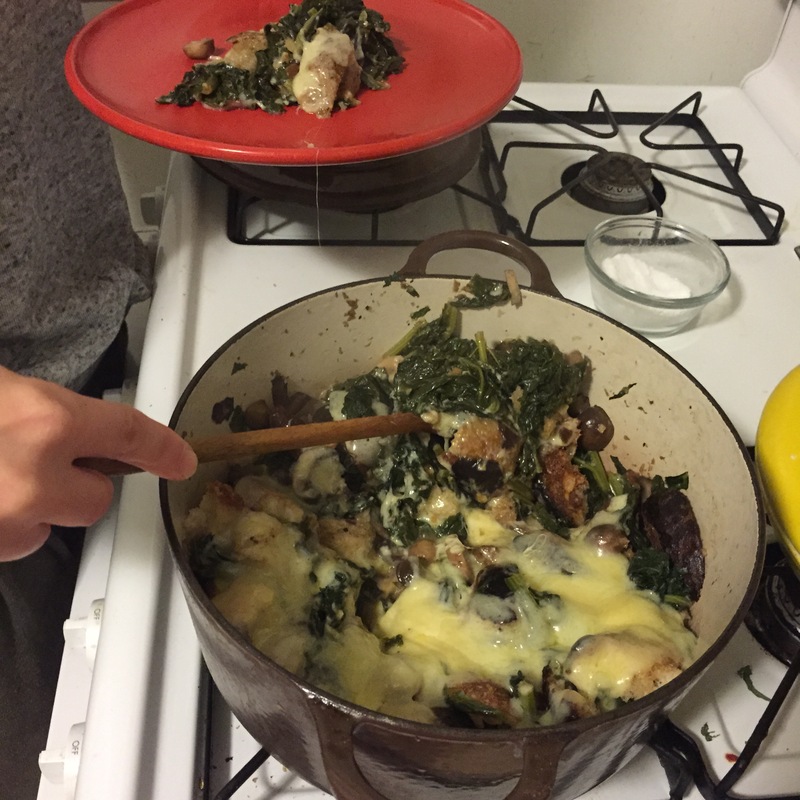 We used the spinach and some kale, sautéed with mushrooms, nestled with some toasted bread, and broiled with some melted cheese on top. It doesn’t look that pretty but it was super tasty and a really quick weeknight meal. After some weekend restaurant eating, we made a Sunday dinner of this “grown up” tuna noodle casserole, the recipe was from The Kitchn. 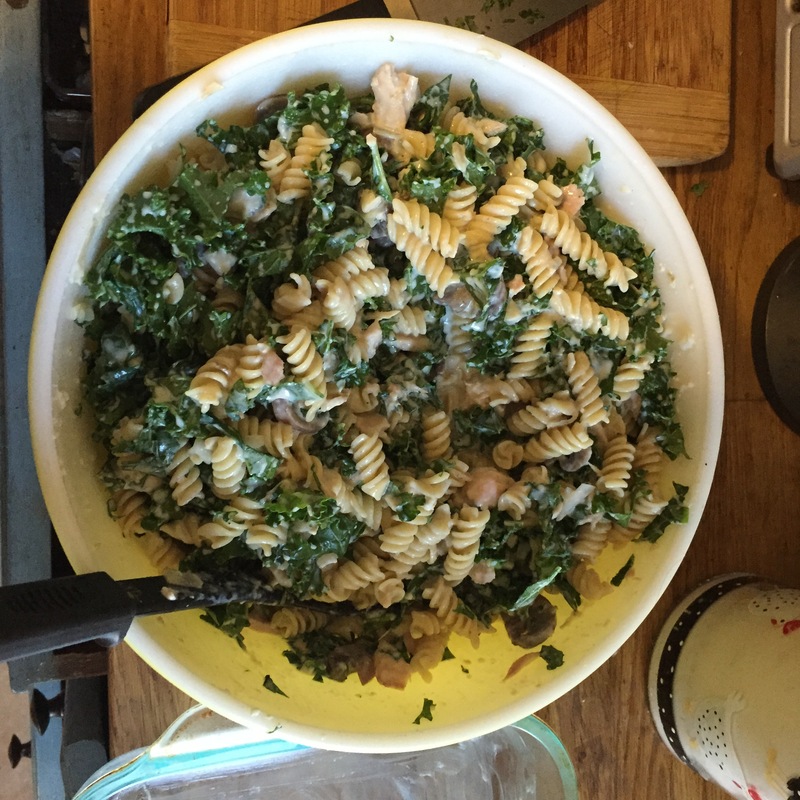 We used some of our share kale in there plus some parsley on top. We also made this with a side of sauteed mustard greens. We’ve made this recipe several times before and will definitely make it again. It also makes great leftovers. All in all, we used a good portion of our greens this first week. 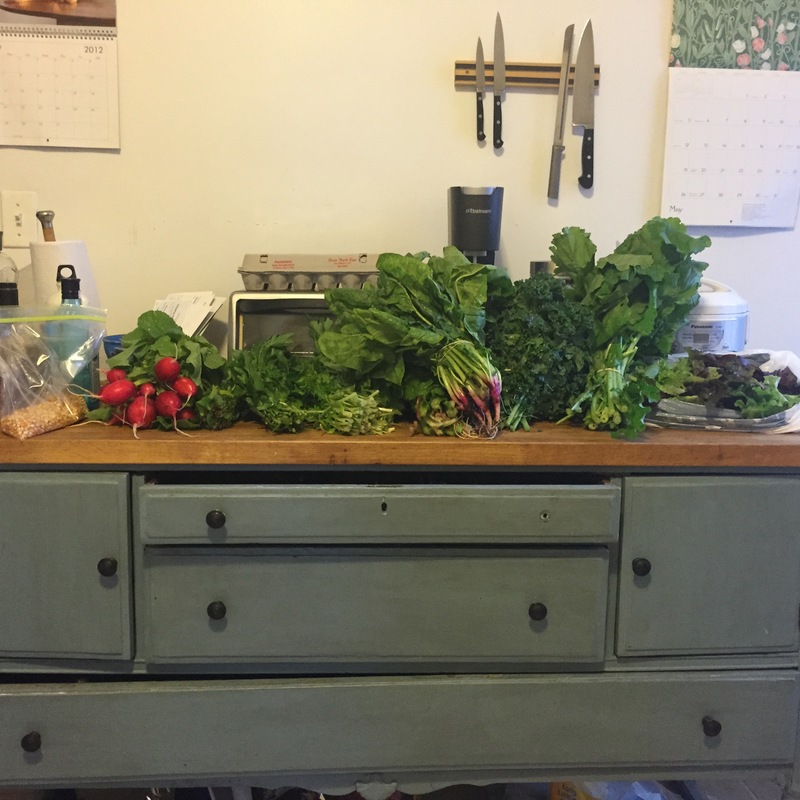 We still have some salad greens, some kale, and some radishes left and we’ll definitely use those up next week. Yay!